Hannah's Maze of Mirrors | Are You The Chosen One? We're sorry. Online tickets are not available right now. Please buy at the Box Office. See you soon and thanks! EXPERIENCE HANNAH'S MAZE OF MIRRORS! Are You The Chosen One? Princess Hannah of Savannah is trapped inside a maze of mirrors, and King Oscar and Queen Emmy need you help to rescue their daughter before time runs out. The Wizard of the Golden Globe has unlocked the maze, ready for you to summon your inner hero and begin the quest to save the Princess. You’ll wind your way through the mirrored corridors hidden inside the Castle of Savannah and find some fun surprises along the way. Plus, discover 288 potential turns and several sections where you see infinite reflections in every direction. 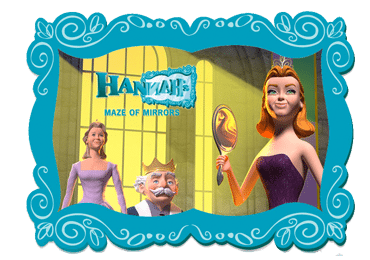 Hannah’s Maze of Mirrors is all about gallantry and fun, where you’ll get lost in a modern-day fairy tale and come out smiling! Hannah’s Maze of Mirrors is full of family fun in our Hollywood Wax Museum Entertainment Centers. Look for our landmark attractions right in the heart of Branson, MO; Myrtle Beach, SC; and Pigeon Forge, TN. You’ll laugh together, enjoy some thrills, and snap fun photos on your vacation or get-away in our popular destinations. If you’re looking for the Best Value in town, consider our All Access Pass. Depending on the location, you’ll get three or four attractions for one ticket price. Let the adventure begin! THE KINGDOM OF SAVANNAH NEEDS A HERO! King Oscar and Queen Emmy are out on a press tour. Beautiful Hannah is left alone with her mirror. What's a young princess to do? Challenging for all of us.